This Song “Yahan Main Ajanabi Hoon” from 1965 film “Jab Jab Phool Khile” depicts the portrayal of betrayal of trust in love. As the story goes, After returning from overseas, heiress Rita is stressed out and needs to go someplace to unwind. She chooses Kashmir and, upon arrival, rents a houseboat from the owner, Raja. After a few misunderstandings, they are attracted to each other and soon fall in love.This romance is not looked upon favorably by Raj Bahadur Chunilal, Rita’s dad, as he would prefer his daughter marry a suitor he has chosen for her: Kishore. Rita dislikes Kishore and will only marry Raja; the wily Raj Bahadur devises a plan that will let him keep the cake and eat it too. To know the full story rest can be watched in the movie,which is a musical hit. The lyrics of this song by Anand Bakshi are well ahead of it’s time, and sums up the entire theme of the movie. Superb Music by Kalyanji Anandji , then assited by Laxmikant Pyarelal andmasterly rendition by one and only the greatest playback singer of all times Mohammad Rafi Saab , who sang the song with great aplomb , depicting the mood of the situation with subtle variations in Voice modulation which was his hallmark. If one notices that each of the stanzas of this song are exceptionally long , but Raafisaab amazingly presented it without taking a single breath with ease. The Film has a very interesting pre and post production incidents about the Sript Writer Brij Katyal , whose story was turned down by three top producers of those times , including N.N.Sippy ,the later producer of Sholay, before it was accepted by Suraj Prakash who felt it was an interesting story. The film turned out to be his Golden Jubilee, greatest hit,. At the film’s Golden Jubilee celebrations, Suraj Prakash asked Brij Katyal what religion Raj belonged to, as it had never been specified and no one had noticed till now. It turned out that all the boatmen in Srinagar were Muslims. The writer was speechless, as this could have been portrayed as a Hindu-Muslim love story. Prakash claims this to be the true climax behind the making of his greatest hit. One may notice how Anand Bakshi cleverly mentioned Hindustani in one of the verses of this song , which clearly portrayed Kashmir as a part of India, such was the patriotic feeling of the lyricist then. Lyricist Anand Bakshi’s career took off after this film. In another interesting incident Director Suraj Prakash and actor Shashi Kapoor made a bet: Prakash said the film would run for 25 weeks and Kapoor, eight weeks. Whoever proved to be right would present the other a suit stitched at Burlington’s. 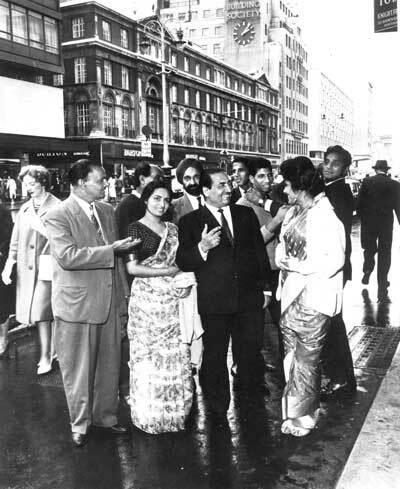 Prakash won the bet and presented the suit to Kapoor; however, each proved to be wrong, as the film ran for 50 weeks and celebrated its golden jubilee. The climax, where Raja pulls Rita into the train, was shot in Bombay Central Train Station. Suraj Prakash gave explicit instructions on how and when to pull Nanda into the train. But when the time came, Kapoor followed those directions so well that there were only a few feet left for the platform to end when he pulled her in. Prakash claims the incident was so hair-raising that he’d shut his eyes, convinced that Nanda’s end had come. The original climax from the script had Raj beating up the bad guys. However, Suraj Prakash rejected it, and after an afternoon watching Love in the Afternoon (1957), settled with Rita leaving everything behind to go back to Kashmir with Raja. ये मै भूले से आ गया हुं कहां !! This entry was posted on Monday, December 24th, 2012 at 2:47 pm	and is filed under Meri Awaaz Suno. You can follow any responses to this entry through the RSS 2.0 feed. You can leave a response, or trackback from your own site. him a divine voice.we rafians have a divine connection with him. In my opinion no praise is enough to describe rafisahab. A man that can evoke so much emotion and feelings through is voice is only 2nd to god. May his wonderful fans keep his memory alive for many decades to come! “My Tribute to the “One and Only One” Greatest Singer of All times Mohd. Rafi Saab on his 88th Birth Anniversary on 24th Dec.
2012 | Rafians tribute to a true Maestro – Mohd Rafi” in fact enables myself contemplate a somewhat more. I loved each and every particular part of this post. There’s a great post by Mr. Raju Korti on the Rafi-Lata spat. I agree 100% with his views. Mr. Korti, we miss you on this forum. It was always a delight to read your posts. Please rejoin this form. When I get more time, I’ll write an article on the Rafi-Lata issue; you will find that you and I are on the same wavelength. post 21….. Pls walk down or drive down to santa cruz police station, juhu , diagnally opp is the Mosque, next to the signal. inside the mosque is the burial ground where many music legends were buried. ask the staff there and will be guided to the burial ground of mohd rafi saaheb. its very much ‘intact’ and you will find fresh flowers at the site. Does anyone know where Rafi Sahab is buried? I would like to go and pay my respects. One and only singer. Rest sang for themselves or fame. He sang for public. May Allah bless his soul, Ameen. our day to day activities.more than our beloved ones. ‘baar baar din ye aaye. hazaar baar dil ye gaaye’ aap rahein amar iss jahan me sada’ ye meri hai aarzoo happy birthday to you, happy birthday to you, happy birthday to you dear rafi saab. happy birthday to you. thanks to the writer for providing a backdrop of the song. rafi saheb was at his best in rendering this song so sweetly and melodiously depicting the sad turmoil through which the hero is passing through. the song was a lesser hit than ‘ pardesiyon se ankhiyan milana..’which had become a rage. wish there could be any way by which we can come to know of actor shashi kapoor’s views on this film, its songs and rafi saheb. yes ur absolutely right.. RAFI Sahab is the greatest playback singer of all time… without a doubt.. without a peer ! Happy Birthday to our Farishta .. the ever-smiling God of Music ! like Manmohan Desai saab once said… if GOD ever sang .. it would be in RAFI Sahab’s Golden Voice ! Jai Rafi Sahab ! I just viewed the performance of Mr. Biswajeet on youtube. Thank you, Rafi Foundation. Great write up…..Shekhar ji on the king of melodys 88th birthday. actor biswajit sang two songs live on 24th and performed at rangsharada, bandra mumbai. it was an exceptional musical evening where the song baar baar din yeh aaye was sung live with all singers and artistes on stage including Biswajit ji, mohd rafi family members which included the grand son, daughter in law and all. mohd rafi bakhts came from many parts including london, ahmedabad, kerala and delhi. thankyou all the rafi bakhts for joining the party and celebrating . THANKS TO ALL HIS FANS. rafi saheb has sung a number of birthday songs for films. now we all the fans sing these songs by remembering his 88th birthday. very very happy birthday to my dearest rafi saheb. Happy Birthday Rafi Saab, the greatest Indian singer ever full stop. Happy Birthday Rafi saab-Sang so many birthday songs hope the angels are singing for him now with shammi kapoor and dev saab dancing around! Janab Rafi Sahab ko Jandin ki dil se bahut bahut mubarakbad. Allah se dua h Rafi sahab ko Jannatul Firdus me ala se ala makam ata farmaye…Aameen. Janab Mohd. Rafi Sahab was not only good singer but also a good personality. He was so down to earth. In my opinion, I think that good voice is not worthwhile without humanity and emotion. 88 years have passed since legend rafisaab was born and he has become immortal and everlasting singing stalwalt and will remain so as long this world is here…today z punjabi tv will be telecasting live programme from 6pm to 8pm from kotla sultan singh the village was born….must for all…. indeed today is a great day for all of us dear raffians.rafissab has embibed the entire philosophy of life.that’s why he was able to sing like a true premi,a king in love.a tangewallah,a father .or whichever charachter he was supposed to sing for.there is a sher-hazaro saal apni benuri pe nargis roti hai,bade mushkil se chaman mein hota hai deedawar paida.i request all of you to listen a song,dil ke aiene mein tasweer teri rahati hai !